Can an inexpensive stand mixer meet most household needs? Which one is top value for your money? There are a number of under $200 models which are good for general purpose mixing. A few can also make a batch of 1 to 3 loaves of bread. Check the Bosch MUM4405 now. But there is one that stands out..the Bosch Compact MUM 4405. Current prices are under $200 which is really cheap for a reliable stand mixer. The Bosch Compact packs a lot in its small and light frame. You couldn’t have guessed that it has a 400-watt motor by its size and weight. That is almost the same power as the Artisan model from KitchenAid which is a lot bulkier and heftier. It has a no-nonsense design that says function is foremost. Several functions are squeezed into its compact frame. No other stand mixer beats it when it comes to making use of every square inch. So, why does the Bosch compact top the list of affordable stand mixers? First, it has enough torque to make 2 to 3 loaves of bread without flinching. It powers through even 2 loaves of whole wheat bread. And, you can run it for 10 – 15 minutes and it only gets warm not hot. Others in the same league have difficulty kneading even one loaf. It’s light and made of durable plastic, yet it doesn’t shake with that amount of load. 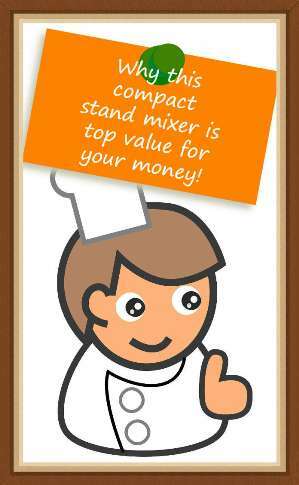 How many accounts have you read of stand mixers shaking, walking, smoking or stalling? The worst report for the Bosch Compact mixer is it walks a bit with bigger amounts. This compact appliance does a good job with egg whites, butter, cakes, cookies, frosting and other general purpose mixing. Ingredient pick-up in its wide and shallow 4-quart bowl is better than in tall curved bowls where pools tend to form at the bottom. The dough hook, stirring whisk or beating whisk attaches to the high torque drive located at the bottom of an arm that tilts up and folds down. Since the bowl is wide, there is enough space to add ingredients. If using the splash ring ingredients can be added through the opening. The splash cover slide on and off easily without lifting the arm, which is so convenient. A streamlined design gives the Bosch Mum4405 compact mixer a small footprint and makes it light enough to be moved around. You fold the drive arm and you can easily carry it and store it in a cabinet. The Bosch MUM 4405 is built for function, performance and ease of use. It’s a dependable machine for both light and heavy mixing. You can have your cake and enjoy your bread, too. You can also turn it into other kitchen appliances with several attachments. It has the power, yet, it’s light and so compact. In my book, the Bosch Compact kitchen machine is top value for the money.